The Daily GRRR! HEADLINES for Jan. 6, 2015. 1. 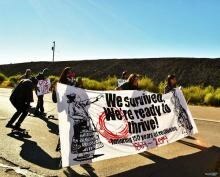 Navajo youth commence 200-mile journey for cultural survival. 2. Pope plans to instruct 1.2 billion Catholics to act on climate change. 3. Canada outed as only country to oppose all endangered species efforts. 4. Families of police officers at greatest risk for domestic violence. 5. California considers statewide ban on ‘Redskins’ as school mascots. 6. German cathedral will shut off lights to protest anti-Muslim march. Welcome back to SoundFM! You are now listening to The Daily GRRR! on the airwaves at 100.3fm, CKMS in Waterloo, Ontario, and SoundFM.ca on the web. This is Kathryn and I’ll be your host on this Tuesday morning show for January 6th, 2015. At dawn on January 6, 2015, a group of young Diné (Navajo) women and their supporters will gather at a fire department near the base of Dził Na’oodiłii (Huerfano Mountain). From there the group will embark on a 200-mile trek through western New Mexico—a tribute to the 150th anniversary of the tragic “Long Walk.” Throughout this journey they intend to raise awareness about historical and present day challenges faced by Diné people and inspire hopeful solutions to address these issues. Organizers are calling out for community support in the form of walking, hosting or helping to garner basic materials. This first journey will end at Tsoodził (Mount Taylor), their southern sacred mountain. Three more walks are scheduled for spring, summer and fall so that each of their four sacred mountains is visited. The walkers intend to cover over 1000 miles in 2015. The commemorated event occurred in 1864 when Colonel Christopher “Kit” Carson—under the command of General James Carleton—enforced a merciless, scorched earth policy to bring Diné people into submission. During this time nearly 9,000 Diné and 500 Mescalero Apache men, women, children and elderlies were marched at gunpoint for 300 miles to a small patch of arid land known as Bosque Redondo, New Mexico. Many perished along the way. During their four-year internment at this reservation “experiment”—known in Diné as Hwééldi or “the place of suffering”—hundreds died due to starvation, illness and physical violence. In 1868, high costs of rations and soldier commissions caused the federal government to disband the experiment and release them back to Diné Tah, the Navajo homeland. As reported by ThinkProgress, at the end of 2015, the nations of the world will meet in Paris and attempt to hammer out a global deal to cut greenhouse gas emissions. And Pope Francis hopes that the world’s Catholics, as well as other major religions, will be a big part of serious climate action. This includes a series of steps next year. Francis is expected to tell the planet’s 1.2 billion Catholics why acting on climate change is essential to the faith using an influential church document called an encyclical, which will reportedly be released to the world’s 5,000 bishops and 400,000 priests following a papal visit to the hurricane-damaged city of Tacloban in the Philippines. In September, the Pope will take his message to the U.N. General Assembly in a New York address next year, according to John Vidal of the Guardian, who cited Vatican insiders. He is set to personally lobby political and faith leaders while there, with the goal of pushing them to commit to real action ahead of the Paris meetings in December of next year. While it isn’t certain what exactly he will tell these leaders, it will likely be similar to what he has been telling Catholics everywhere since the beginning of his papacy. Last month, during the climate talks in Lima, Peru, Catholic bishops from every continent called for “an end to the fossil fuel era”, and as Pope Francis told a massive crowd in Rome earlier in the year, “if we destroy Creation, Creation will destroy us!” He has called the destruction of the rainforest a “sin,” and under his leadership, the Church held a five-day summit with scientists, economists, philosophers, astronomers, and other experts to explore ways the Catholic church could address climate and sustainability. As reported by SumOfUs.org, Canada just became the first nation in history to opt out of every proposed resolution protecting new endangered species from international trade. This is unprecedented, they say, as documents just released from a 2013 Convention on International Trade in Endangered Species (CITES) show that Canada expressed “reservations” on extending protection to all 76 species added to the charter. That means the world said, “We need to protect this animal or plant right now” and our government answered, “meh.” 76 times. There is literally no other country with a more isolated and radical opposition to protecting endangered species from international trade than Canada, and yet Canada doesn’t even harvest or trade in most of the species listed -- like manatees, manta rays or ebony -- making its decision even more baffling. So are its excuses: the government says its opposition is only “technical,” yet has done nothing to bring its regulations in line almost two years after the convention. This is part of a worrying trend from the Harper government attacking conservation measures of all kinds. The federal government recently gutted key protections for endangered species, thousands of waterways, and even our beloved national parks, all to allow for rampant oil and gas development. But SumOfUs members are fighting back. Together we’ve pushed to keep BC’s humpback whales on the endangered species list, fought to stop drilling in the Arctic narwhals’ territory, and called on Harper to protect Quebec’s beluga whale population from the Energy East pipeline terminal. As we ramp up to this year’s federal election, they say, we need to make sure our government puts the well-being of communities and strong environmental protections before oil companies’ profits. As reported by Mic.com, in families of police officers, domestic violence is two-to-four times more likely to occur than in the general population — from stalking and harassment to sexual assault and even homicide. As the National Center for Women and Policing notes, two studies have found that at least 40% of police officer families experience domestic violence, in contrast to 10% of families in the general population. A 2013 Bowling Green State University study, through news searches, tallied 324 cases of reported officer domestic violence. It is likely that this number is a gross underestimate, because as the National Center for Women and Policing has detailed, officers frequently cover for each other. "A big part of police culture is the code of silence," says Diane Wetendorf, author of Police Domestic Violence: A Handbook for Victims. "The prosecutors depend on police for their cases, the police depend on each other — it's a very insulated system." A September analysis on officer domestic violence by The Atlantic explains how cases come to be underreported. It's not just that women are more intimidated to report domestic violence because their attackers are officers and worry that nobody will believe them; there’s also the factor that officers adjudicate the entire process on an informal level: "Cops 'typically handle cases of police family violence informally, often without an official report, investigation, or even check of the victim's safety,'" writes Conor Friedersdorf for The Atlantic, quoting a study from the National Center for Women and Policing. "'Even officers who are found guilty of domestic violence are unlikely to be fired, arrested or referred for prosecution.'" From underreporting by victims and colleagues to informal investigations, this means that available statistics only hint at the pervasive violence perpetrated by the people who are paid to protect and serve us. If evidence from a 2007 change in reporting arrests of Florida officers is any indication, if all cases of officer domestic violence were actually reported, the statistics would mostly likely double. While controversy boils around the NFL’s Washington Redskins name, high schools remain among the most common offenders when it comes to the appropriation of Native American names and slurs for their team names. According to a study by FiveThirtyEight, of the 2,128 high school, college, semi-pro and amateur teams using such names, 92 percent are high schools. But while schools in New York,Washington, Massachusetts and beyond have voluntarily dropped the ‘Redskins’ name in favor of alternatives (such as ‘Redhawks’), four schools in California continue to bear the offensive name. While their holdout may now be short-lived, it would not be a surprise if the bill failed to pass, as this is not the first time such a bill has entered the California legislature. In 2004, former Gov. Arnold Schwarzenegger vetoed a bill banning use of Native American nicknames at the state’s public schools. Remember that the next time you think about watching Terminator. As reported by The Guardian, one of Germany’s most famous landmarks ~ Cologne Cathedral ~ will be plunged into darkness on Monday evening in protest of a march by a grassroots anti-Muslim movement through the western German city. The rise of Patriotic Europeans Against the Islamisation of the West (also known as “Pegida”) has shaken the political establishment, prompting German chancellor Angela Merkel to warn in her new year’s address that its leaders were racists full of hatred and that citizens should beware being used. The group’s last weekly rally in the eastern city of Dresden attracted an estimated 17,000 people, and it plans to hold further marches in other cities.